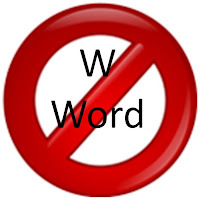 Welcome to Mr. Gus's Journal: Why we never say the "W Word" in recreational shooting sports. Why we never say the "W Word" in recreational shooting sports. The word weapon defined is any instrument or device for use in attack or defense in combat, fighting, or war, as a sword, rifle, or cannon; or anything used against an opponent, adversary, or victim. Is that why we are teaching youth and youth volunteers shooting sports? I think not. We are teaching kids and the community safe, recreational shooting to build marksmanship skills, discipline and responsibility in the use of a firearm. We leave weapon training to law enforcement and our military service members - where that word is appropriate. It also has perfectly reasonable context in conversations about home and self protection. The next time you're in a training situation, either as the coach or the student, I encourage each of us to call the firearm just that, a firearm or even better call it by its name. Use the specific terms for them such as rifle, pistol, handgun, shotgun, etc. That's more appropriate, and it won't leave images in the mind of your students of taking someone's life.